Born on January 26, 1874 in Wooster, Irvin Key Wilhelm went to Wooster High before there were organized sports, but that didn’t stop him from becoming a major league pitcher. Wilhelm pitched for five different teams from 1903-21. Wilhelm was a right-handed hurler and pitched the majority of his career in the dead-ball era. Having graduated from WHS in either 1893 or 1894, Wilhelm, known throughout his time in the majors by the nickname “Kaiser,” broke into the big leagues on April 18, 1903 with the Pittsburgh Pirates. He put up a 3.24 ERA in 86 innings pitched in his rookie year in which he went 5-3 for his only winning season. The following two years he pitched for the Boston Beaneaters, winning 14 games in 1904 and then going 3-23 in 1905. In 1904, going 14-20, he pitched an amazing 30 complete games. That record knocked him out of the majors for two seasons, but it didn’t keep him out. 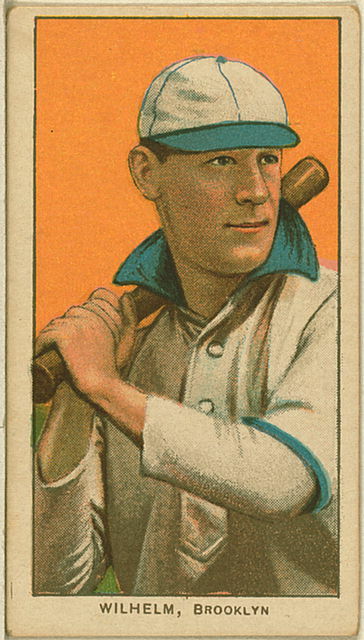 Wilhelm returned in 1908 with the Brooklyn Superbas, soon to known as the Dodgers, and had his best season. Despite a misleading 16-22 record, his ERA was 1.87 and he allowed just 266 hits in a career-high 332 innings, tossing six shutouts. After two more seasons in Brooklyn, Wilhelm had another three-year break and came back in 1914 for two seasons with Baltimore before retiring at age 41 in 1915. His won-loss record was just 56-105, but his career ERA was 3.44 in over 1,430 major-league innings. Wilhelm returned to the majors in 1921-22 as the manager of the Philadelphia Phillies. He pitched in four games in 1921 and at age 47 became the sixth-oldest pitcher in major league history as he wrapped up his nine-year stint in the big leagues. His managerial record in his two seasons with the Phillies was 83-137. During his tenure, he pitched for Pittsburgh (1903), Boston Terrapins (1914-15) and Philadelphia (1921). He recorded 444 strikeouts and reached double-digits in victories three times—1904, 1908, and 1914, when he went 12-17 with Baltimore. That season, he had 18 complete games, as well as five saves. Wilhelm may not have had a glittering won-loss record, but he was, typical of the time he played, a workhorse on the mound. In 158 major-league starts, he pitched 118 complete games. Irvin Key “Kaiser” Wilhelm died on May 26, 1936 at the age of 62.